5.1.1. What is a score? Every initialized Solution has a score. That score is an objective way to compare 2 solutions: the solution with the higher score is better. The Solver aims to find the Solution with the highest Score of all possible solutions. The best solution is the Solution with the highest Score that Solver has encountered during solving, which might be the optimal solution. All score techniques are based on constraints. 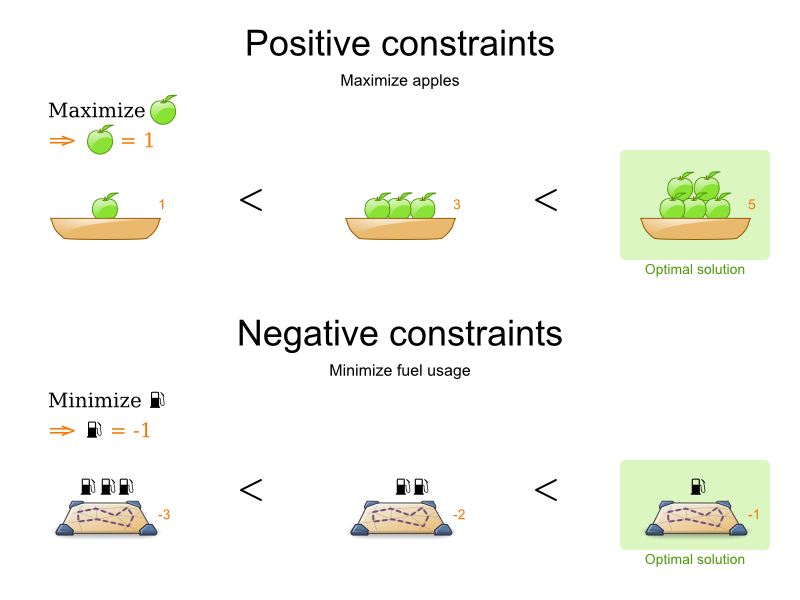 Such a constraint can be a simple pattern (such as Maximize the apple harvest in the solution) or a more complex pattern. A positive constraint is a constraint you're trying to maximize. A negative constraint is a constraint you're trying to minimize. Notice in the image above, that the optimal solution always has the highest score, regardless if the constraints are positive or negative. Most planning problems have only negative constraints and therefore have a negative score. In that case, the score is usually the sum of the weight of the negative constraints being broken, with a perfect score of 0. This explains why the score of a solution of 4 queens is the negative (and not the positive!) of the number of queen couples which can attack each other. Negative and positive constraints can be combined, even in the same score level. Don't presume your business knows all its score constraints in advance. Expect score constraints to be added or changed after the first releases. When a constraint activates (because the negative constraint is broken or the positive constraint is fulfilled) on a certain planning entity set, it is called a constraint match. Score weighting is often used in use cases where you can put a price tag on everything. In that case, the positive constraints maximize revenue and the negative constraints minimize expenses: together they maximize profit. Alternatively, score weighting is also often used to create social fairness. For example: nurses that request a free day on New Year's eve pay a higher weight than on a normal day. The weight of a constraint match can be dynamically based on the planning entities involved. For example in cloud balance: the weight of the soft constraint match for an active Computer is the cost of that Computer. Sometimes a score constraint outranks another score constraint, no matter how many times the other is broken. In that case, those score constraints are in different levels. For example: a nurse cannot do 2 shifts at the same time (due to the constraints of physical reality), this outranks all nurse happiness constraints. Most use cases have only 2 score levels: hard and soft. When comparing 2 scores, they are compared lexicographically: the first score level gets compared first. If those differ, the others score levels are ignored. 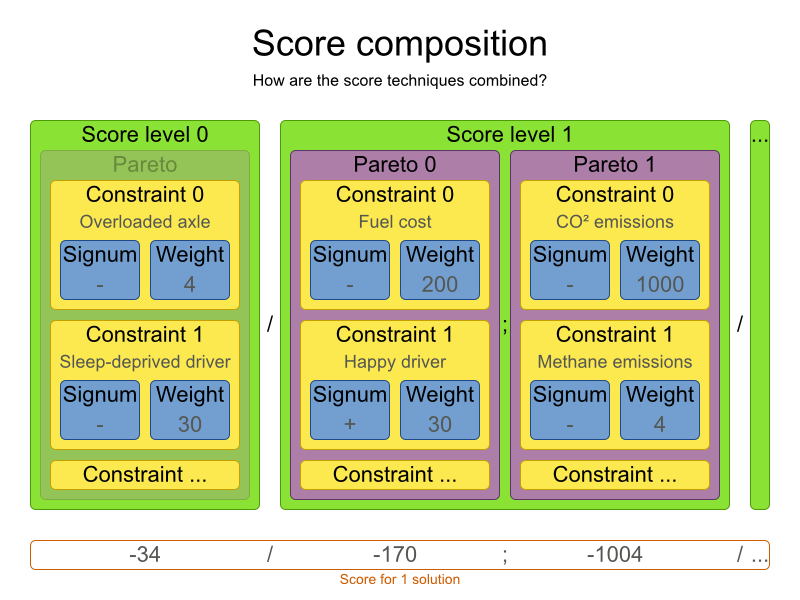 For example: a score that breaks 0 hard constraints and 1000000 soft constraints is better than a score that breaks 1 hard constraint and 0 soft constraints. Score levels often employ score weighting per level. In such case, the hard constraint level usually makes the solution feasible and the soft constraint level maximizes profit by weighting the constraints on price. Your business will probably tell you that your hard constraints all have the same weight, because they cannot be broken (so their weight does not matter). This is not true and it could create a score trap. For example in cloud balance: if a Computer has 7 CPU too little for its Processes, then it must be weighted 7 times as much as if it had only 1 CPU too little. This way, there is an incentive to move a Process with 6 CPU or less away from that Computer. 3 or more score levels is supported. For example: a company might decide that profit outranks employee satisfaction (or visa versa), while both are outranked by the constraints of physical reality. 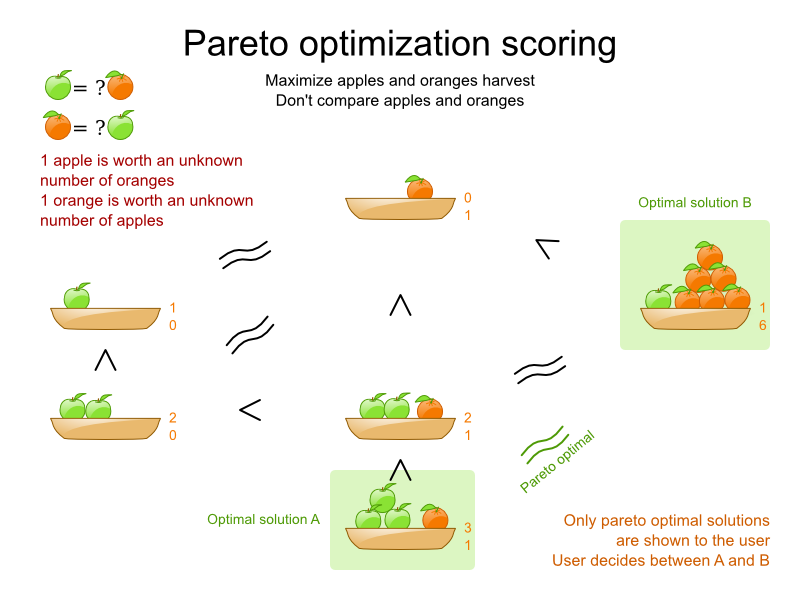 Far less common is the use case of pareto optimization, which is also known under the more confusing term multi-objective optimization. In pareto scoring, score constraints are in the same score level, yet they are not weighted against each other. When 2 scores are compared, each of the score constraints are compared individually and the score with the most dominating score constraints wins. Pareto scoring can even be combined with score levels and score constraint weighting. Consider this example with positive constraints, where we want to get the most apples and oranges. Since it's impossible to compare apples and oranges, we can't weight them against each other. Yet, despite that we can't compare them, we can state that 2 apples are better then 1 apple. Similarly, we can state that 2 apples and 1 orange are better than just 1 orange. So despite our inability to compare some Scores conclusively (at which point we declare them equal), we can find a set of optimal scores. Those are called pareto optimal. Scores are considered equal far more often. It's left up to a human to choose the better out of a set of best solutions (with equal scores) found by Planner. In the example above, the user must choose between solution A (3 apples and 1 orange) and solution B (1 apples and 6 oranges). It's guaranteed that Planner has not found another solution which has more apples or more oranges or even a better combination of both (such as 2 apples and 3 oranges). To implement pareto scoring in Planner, implement a custom ScoreDefinition and Score. Future versions will provide out-of-the-box support. A pareto Score's method compareTo is not transitive because it does a pareto comparison. For example: 2 apples is greater than 1 apple. 1 apples is equal to 1 orange. Yet, 2 apples are not greater than 1 orange (but actually equal). Pareto comparison violates the contract of the interface java.lang.Comparable's method compareTo, but Planner's systems are pareto comparison safe, unless explicitly stated otherwise in this documentation. The Score implementation to use depends on your use case. Your score might not efficiently fit in a single double value. Planner has several build-in Score implementations, but you can implement a custom Score too. Most use cases will just use the build-in HardSoftScore. As for all calculations with a computer, choose the correct type. Don't use a double for financial data. Each Score implementation also has a ScoreDefinition implementation. For example: SimpleScore is definied by SimpleScoreDefinition. A SimpleScore has a single int value, for example -123. It has a single score level. SIMPLE_LONG: Uses SimpleLongScore which has a long value instead of an int value. SIMPLE_DOUBLE: Uses SimpleDoubleScore which has a double value instead of an int value. SIMPLE_BIG_DECIMAL: Uses SimpleBigDecimalScore which has a BigDecimal value instead of an int value. A HardSoftScore has a hard int value and a soft int value, for example -123hard/-456soft. It has 2 score levels (hard and soft). HARD_SOFT_LONG: Uses HardSoftLongScore which has long values instead of int values. HARD_SOFT_DOUBLE: Uses HardSoftDoubleScore which has double values instead of int values. 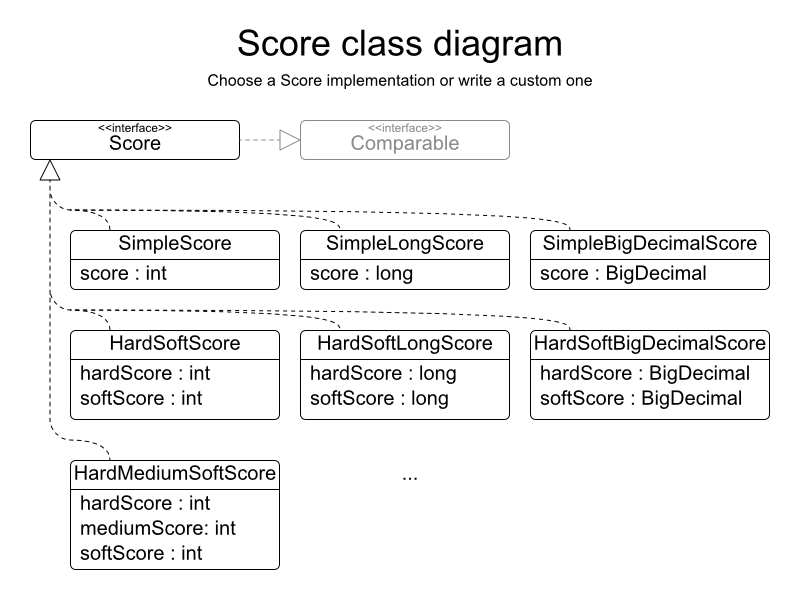 HARD_SOFT_BIG_DECIMAL: Uses HardSoftBigDecimalScore which has BigDecimal values instead of int values..
A HardMediumSoftScore which has a hard int value, a medium int value and a soft int value, for example -123hard/-456medium/-789soft. It has 3 score levels (hard, medium and soft). A BendableScore has a configurable number of score levels. It has an array of hard int values and an array of soft int value, for example 2 hard levels and 3 soft levels for a score -123/-456/-789/-012/-345. The number of hard and soft score levels needs to be set at configuration time, it's not flexible to change during solving. The ScoreDefinition interface defines the score representation. To implement a custom Score, you'll also need to implement a custom ScoreDefinition. Extend AbstractScoreDefinition (preferable by copy pasting HardSoftScoreDefinition or SimpleScoreDefinition) and start from there. Every score calculation type can use any Score definition. For example, simple Java score calculation can output a HardSoftScore. All score calculation types are Object Orientated and can reuse existing Java code. A simple way to implement your score calculation in Java. A way to implement your score calculation incrementally in Java. Optionally, to get better output when the IncrementalScoreCalculator is corrupted in environmentMode FAST_ASSERT or FULL_ASSERT, you can overwrite the method buildScoreCorruptionAnalysis from AbstractIncrementalScoreCalculator. Implement your score calculation using the Drools rule engine. Every score constraint is written as one or more score rules. In every release, the Drools rule engine tends to become faster. There are several ways to define where your score rules live. You can add multiple <scoreDrl> entries if needed, but normally you'll define all your score rules in 1 file. 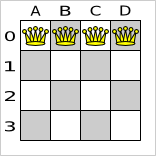 In this solution the multipleQueensHorizontal score rule will fire for 6 queen couples: (A, B), (A, C), (A, D), (B, C), (B, D) and (C, D). Because none of the queens are on the same vertical or diagonal line, this solution will have a score of -6. An optimal solution of 4 queens has a score of 0. Notice that every score rule will relate to at least 1 planning entity class (directly or indirectly though a logically inserted fact). This is normal: it would be a waste of time to write a score rule that only relates to problem facts, as the consequence will never change during planning, no matter what the possible solution. The variable kcontext is a magic variable in Drools Expert. The scoreHolder's method uses it to do incremental score calculation correctly and to create a ConstraintMatch instance. A ScoreHolder instance is asserted into the KieSession as a global called scoreHolder. Your score rules need to (directly or indirectly) update that instance. Most use cases will also weigh their constraint types or even their matches differently, by using a specific weight for each constraint match. // than the number of seats of all the rooms that host its lectures. // Each student above the capacity counts as 1 point of penalty. // to each other (i.e., in consecutive periods). // to any other lecture within the same day. // Each isolated lecture in a curriculum counts as 2 points of penalty. Put the environmentMode in FULL_ASSERT (or FAST_ASSERT) to detect corruption in the incremental score calculation. For more information, see the section about environmentMode. However, that will not verify that your score calculator implements your score constraints as your business actually desires. This way, the scoreDrl will be validated by the SimpleScoreCalculator. The Solver will normally spend most of its execution time running the score calculation (which is called in its deepest loops). 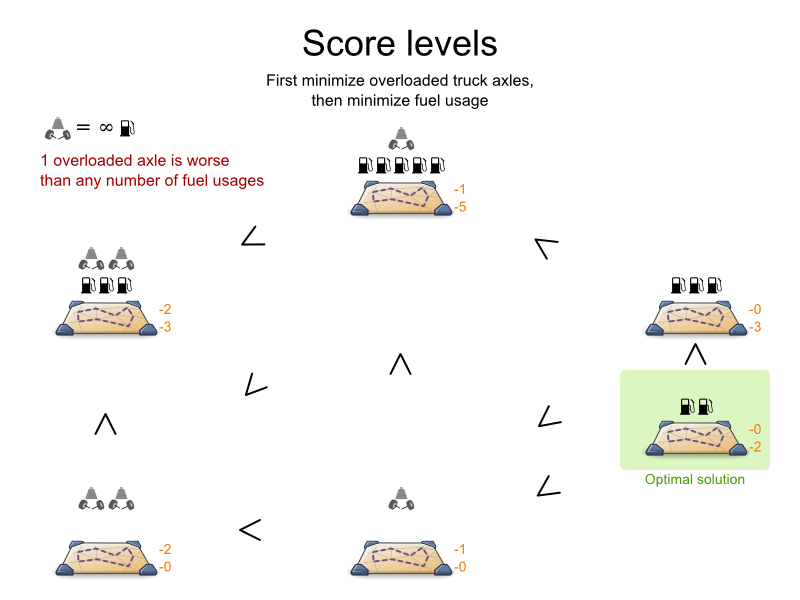 Faster score calculation will return the same solution in less time with the same algorithm, which normally means a better solution in equal time. After solving a problem, the Solver will log the average calculation count per second. This is a good measurement of Score calculation performance, despite that it is affected by non score calculation execution time. It depends on the problem scale of the problem dataset. Normally, even for high scale problems, it is higher than 1000, except when you're using SimpleScoreCalculator. When improving your score calculation, focus on maximizing the average calculation count per second, instead of maximizing the best score. A big improvement in score calculation can sometimes yield little or no best score improvement, for example when the algorithm is stuck in a local or global optima. If you're watching the calculation count instead, score calculation improvements are far more visible. Furthermore, watching the calculation count, allows you to remove or add score constraints, and still compare it with the original calculation count. Comparing the best score with the original would be wrong, because it's comparing apples and oranges. When a Solution changes, incremental score calculation (AKA delta based score calculation), will calculate the delta with the previous state to find the new Score, instead of recalculating the entire score on every solution evaluation. For example, if a single queen A moves from row 1 to 2, it won't bother to check if queen B and C can attack each other, since neither of them changed. This is a huge performance and scalability gain. Drools score calculation gives you this huge scalability gain without forcing you to write a complicated incremental score calculation algorithm. Just let the Drools rule engine do the hard work. Notice that the speedup is relative to the size of your planning problem (your n), making incremental score calculation far more scalable. Do not call remote services in your score calculation (except if you're bridging SimpleScoreCalculator to a legacy system). The network latency will kill your score calculation performance. Cache the results of those remote services if possible. If some parts of a constraint can be calculated once, when the Solver starts, and never change during solving, then turn them into cached problem facts. If you know a certain constraint can never be broken, don't bother writing a score constraint for it. 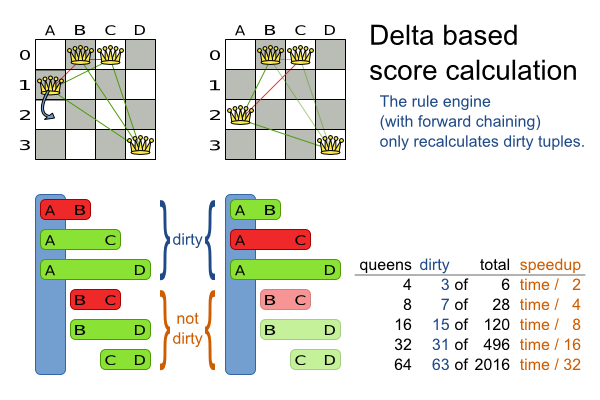 For example in n queens, the score calculation doesn't check if multiple queens occupy the same column, because a Queen's column never changes and every Solution starts with each Queen on a different column. Don't go overboard with this. If some datasets don't use a specific constraint but others do, just return out of the constraint as soon as you can. 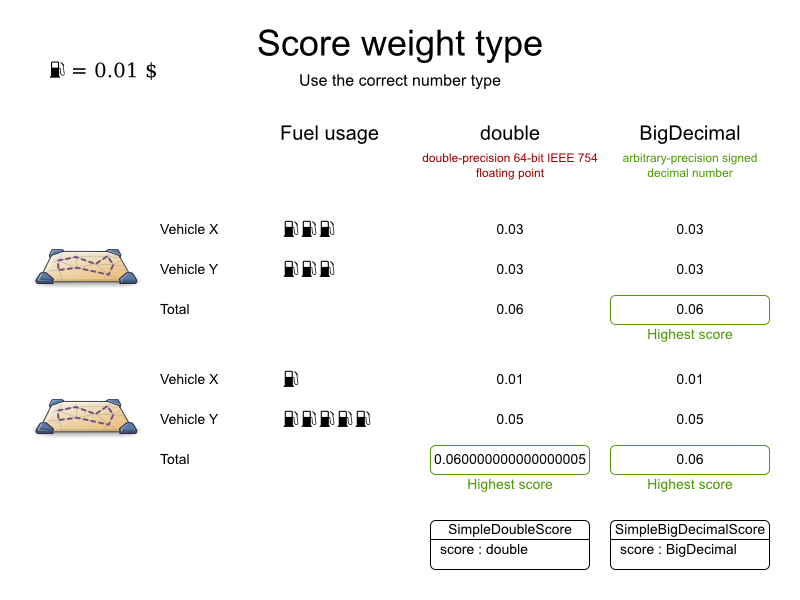 There is no need to dynamically change your score calculation based on the dataset. Instead of implementing a hard constraint, you can sometimes make it build-in too. For example: If Course A should never be assigned to Room X, but it uses ValueRange from Solution, the Solver will often try to assign it to Room X too (only to find out that it breaks a hard constraint). Use filtered selection to define that Course A should only be assigned a Room other than X. This tends to give a good performance gain, not just because the score calculation is faster, but mainly because most optimization algorithms will spend less time evaluating unfeasible solutions. Don't go overboard with this. Many optimization algorithms rely on the freedom to break hard constraints when changing planning entities, to get out of local optima. There is a real risk of trading short term benefits for long term harm. Verify that your score calculation happens in the correct Number type. If you're making the sum of int values, don't let Drools sum it in a double which takes longer. For optimal performance, always use server mode (java -server). We have seen performance increases of 50% by turning on server mode. For optimal performance, use the latest Java version. For example, in the past we have seen performance increases of 30% by switching from java 1.5 to 1.6. Always remember that premature optimization is the root of all evil. Make sure your design is flexible enough to allow configuration based tweaking. If you need 2 doctors at each table, but you're only moving 1 doctor at a time. So the solver has no incentive to move a doctor to a table with no doctors. Punish a table with no doctors more then a table with only 1 doctor in that score constraint in the score function. 2 exams needs to be conducted at the same time, but you're only move 1 exam at a time. So the solver has a disincentive move one of those exams to another timeslot without moving the other in the same move. Add a course-grained move that moves both exams at the same time. The Solver should eventually get out of this trap, but it will take a lot of effort (especially if there are even more processes on the overloaded computer). Before they do that, they might actually start moving more processes into that overloaded computer, as there is no penalty for doing so. Avoiding score traps does not mean that your score function should be smart enough to avoid local optima. Leave it to the optimization algorithms to deal with the local optima. 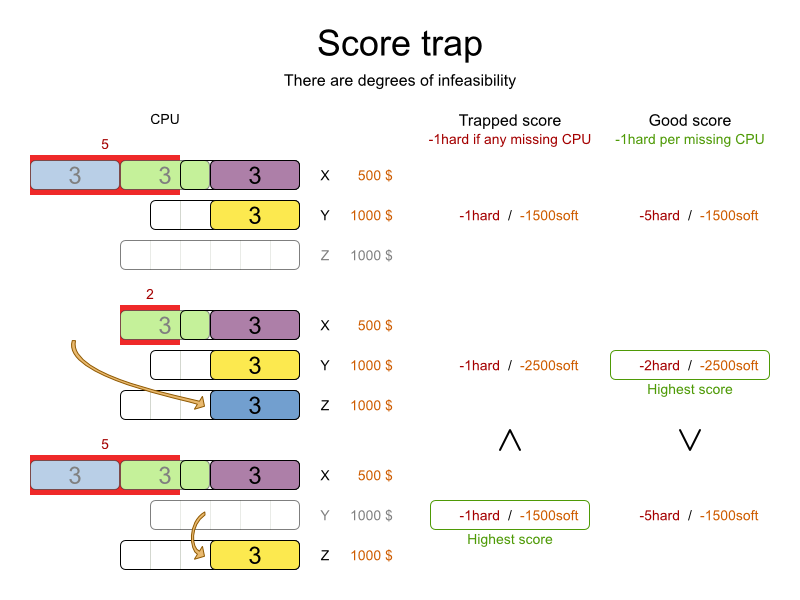 Avoiding score traps means to avoid - for each score constraint individually - a flatlined score function. Always specify the degree of infeasibility. The business will often say: "if the solution is infeasible, it doesn't matter how infeasible it." While that's true for the business, it's not true for score calculation: it benefits from knowing how infeasible it is. In practice, soft constraints usually do this naturally and it's just a matter of doing it for the hard constraints too. 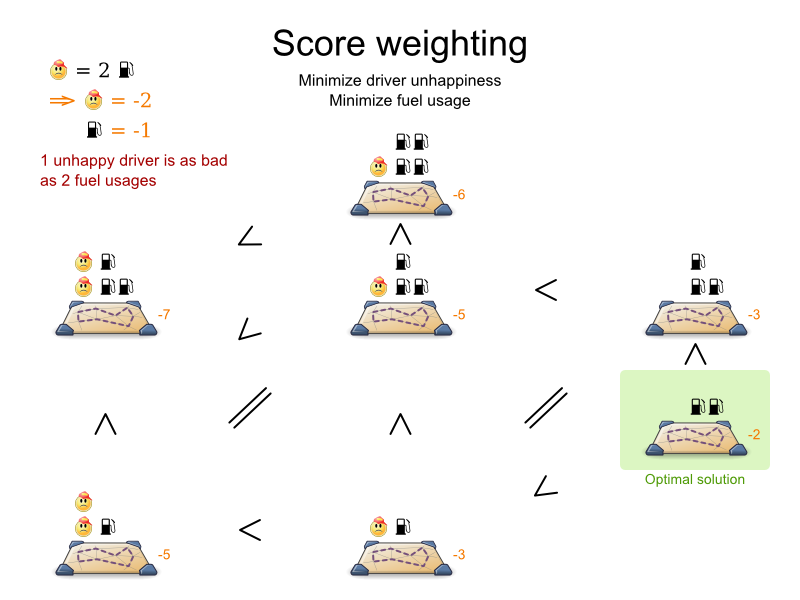 Improve the score constraint to make a distinction in the score weight. 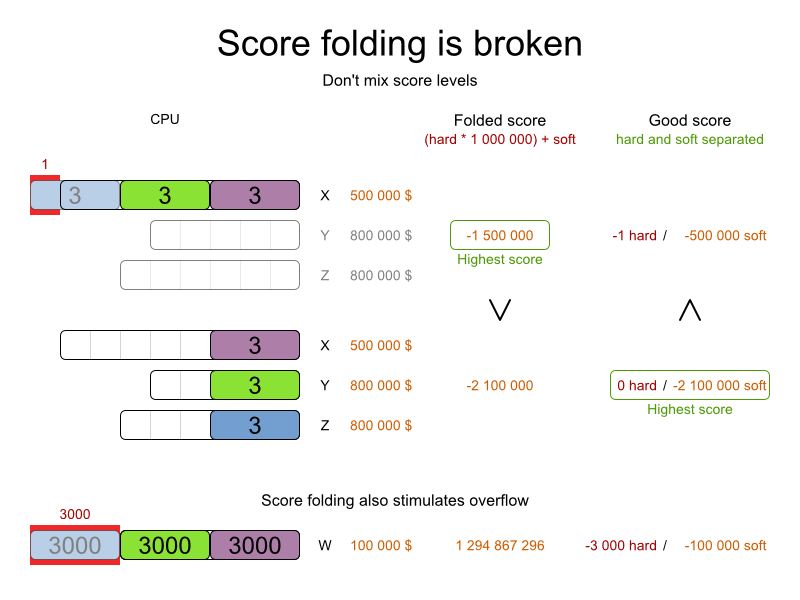 For example: penalize -1hard for every missing CPU, instead of just -1hard if any CPU is missing. If changing the score constraint is not allowed from the business perspective, add a lower score level with a score constraint that makes such a distinction. For example: penalize -1subsoft for every missing CPU, on top of -1hard if any CPU is missing. The business ignores the subsoft score level. Add course-grained moves and union select them with the existing fine-grained moves. A course-grained move effectively does multiple moves to directly get out of a score trap with a single move. For example: move multiple items from the same container to another container. Not all score constraints have the same performance cost. Sometimes 1 score constraint can kill the score calculation performance outright. Use the benchmarker to do a 1 minute run and check what happens to the average calculation count per second if you comment out all but 1 of the score constraints. Tto explain in the GUI what entities are causing which part of the Score, get the ConstraintMatch objects from the ScoreDirector.